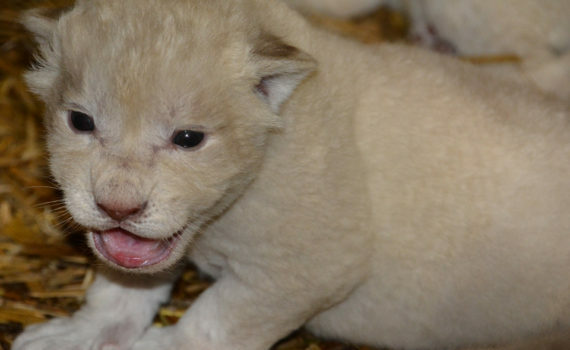 The Metro Richmond Zoo is pleased to announce the birth of 3 White lion cubs born to parents, Xonga and Basa, on April 2nd, 2018. After a 110 day gestation period, Xonga, a 3 year old, first time mother, gave birth to 1 male and 2 female cubs. Xonga has shown excellent maternal care for her cubs. Both mom and babies are in great health. The cubs have been nursing, and they are growing rapidly. Xonga and her babies are currently in their off exhibit, private den. This allows time for the cubs and mom to bond. Once they are old enough, Xonga and her cubs will go outside on exhibit. White lions are a rare color mutation of the African lion that occurs naturally in the Timbavati region in South Africa. They are not albino; they are leucistic, which is a lack of dark pigmentation. They get their coloring from a recessive gene known as a color inhibitor. While similar to albinism, this gene is far less severe. White lions still have pigmentation present in their eyes, paws, and lips. White lions can range in color from pale blonde to completely white. 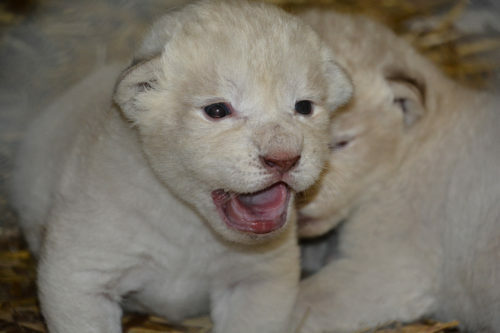 To produce a white lion, both parents must possess the recessive gene.